The 2018 Senator Paul Simon Award Presidential Panel webcast was held November 13, 2018, in Washington, D.C. The event featured a panel of leaders from Simon Award-winning colleges and universities discussing their successes and challenges in campus internationalization. 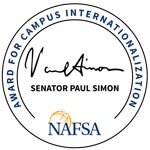 In 2018, five institutions were honored with the NAFSA Senator Paul Simon Award for Comprehensive Internationalization and three institutions were honored with the NAFSA Senator Paul Simon Spotlight Award. Leaders from four of the honored institutions will participate in the Presidential Panel. The Simon Awards celebrate the legacy of the late Senator Paul Simon of Illinois, a life-long advocate for international education and exchange, recognizing universities and programs that promote international understanding and a more just and peaceful world. For 15 years, NAFSA: Association of International Educators has honored outstanding achievement in campus internationalization. NAFSA provides programs, products, and services to support campus internationalization and to serve the needs of international educators.